I knew from the forecast and Accuweather radar that it was going to rain today, so I walked to the post office, took out the trash, and weeded my herb garden early(ish) this morning. I had only weeded a bit of the herb garden before it began to rain, but at least I got some of it done. I saw that my borage is flowering. I went out later in the afternoon–in between rain storms–to take pictures of it. I like growing Borage because its flowers are edible. They taste sort of like cucumbers. Garden websites always suggest freezing the flowers in ice cubes for decorative cubes or putting them in salads. I picked some of the flowers today and JJ and I simply ate them. It’s kind of fun eating flowers. EJ and I found four hollow logs that we will use as toad houses. We have set out three of them so far. I can’t take pictures, though, because a storm is moving in. We are enjoying watching the sparrows in the blue birdhouse raise another nest of babies. The babies are now big enough that we can catch glimpses of them. Here is a video I took today of Mama and Papa Sparrow feeding their young. They struggled for bit, both trying to feed the babies. If you look closely, you can see a brief glimpse of a baby in the birdhouse. I love watching the birds. 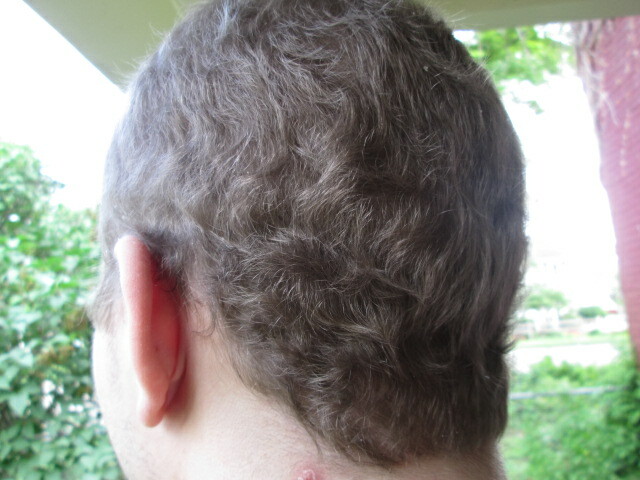 We were often told that when people have Chemo, their hair can grow back with a different color or texture. We were very interested to see what JJ’s hair would look like when it grew back. At first, it didn’t look like there was any real change. However, his hair now looks as if it will be a bit darker than before It is still very, very soft. Also, it is much more curly. His hair was very straight before. JJ says that he doesn’t like having curly hair. He thinks it’s weird. I made him let me take a picture of his beautiful curly hair. I feel as if, like Borg, Extroverts love to do things in a collective group and they don’t understand or appreciate those who don’t. They want to “raise the quality of life” of Introverts by forcing us to become one of them. There is no room for individuality, for being different. They try to drag us to parties to show us what “fun” looks like, they want us to be outspoken like they are, they tell us that we “think too much.” They can’t understand that we do not like being a part of a group. We prefer to be distinctive individuals. We prefer and are energized by quiet, we are loneliest in a crowd, we enjoy fun in a different way, we listen more than we speak, and we tend to speak only when we have something important to say. And then there are Empaths. EJ and I are introverts and empaths. I am much more introverted than EJ, and probably more of an empath although he is very empathetic. I say that I am more empathetic because I actually get faint when encountering suffering. In my 20s I went to a Behavioral Specialist to learn how to not faint around suffering (such as hospitals), and I did very well for years, but I struggled with faintness again when my son underwent treatment and surgery for Cancer. The article EJ and I discussed, called “30 Traits of an Empath” described us very accurately. Empaths very deeply feel the suffering of others. Because of this, we are very compassionate, gentle, and understanding people. We are good listeners so people usually tell us their problems. Among other traits, we dislike lies and pursue truth. We struggle with those who are critical, negative, self-centered, narcissistic, who can see no opinions other than their own. We need solitude. We are very creative and imaginative. Often we express ourselves artistically; many of us become writers. We love nature and animals. We love to pursue knowledge and to think. We love freedom and hate control. We hate to be assimilated. Both EJ and I felt that we love old things because we love their connection to history and stories, and we rarely are bored by routine tasks because “boring” tasks allow our minds to wander. I love articles about Introverts and Empaths because they help me know myself better, and because it reinforces that we are NOT flawed. We are DIFFERENT. Here are some more good articles about the characteristics of Introverts/Empaths. I think both Introverts and Extroverts would find them helpful. I like eating flowers too!